A little bit of planning goes a long way in making sure your trip goes as comfortably as possible. The tips below were provided by seasoned vegan travelers. Many people are surprised to know that you are allowed to take food with you through security in airports. The only restriction there is in terms of food is that all liquids must be 100ml (3.4 ounces) or less, which unfortunately means no hummus, smoothies and juices, or dips. However, airport security usually lets meals slide with some liquids in them, such as salads with dressing. If in doubt, you can pack dressings, dips, and margarines in watertight 100ml containers and pack them in with your liquids. If you forgot to order a vegan meal in advance, or your airline doesn’t offer one (unfortunately some of those airlines do exist), you can always ask the flight attendant if they offer a salad or fruit bowl with the meal, and just ask them to give you that. Or if you brought your own meal with you, you can always just ask them for the meal tray along with napkins and cutlery. If you want to get really fancy on long-haul flights, you could pack ramen noodles or couscous with some vegetables and flavour packets in a reusable container, and ask the flight attendants to fill the container up with the hot water they offer for tea. 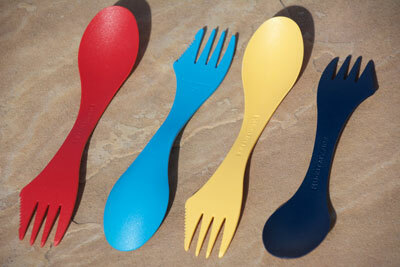 Sporks are a wonderful dining tool to take with you. They are a combination spoon/knife/fork all in one. You just grab your spork and you are ready to dine anywhere you travel. For a plastic-free option, bamboo cutlery is a great option. Some kits come with a spoon, fork, knife, and chopsticks wrapped in a reusable cloth container. All of these ideas also work for road trips and traveling, although eating is a bit easier when not on a plane – you can bring all of the hummus and guacamole you desire! Going through flights and security can be very uncomfortable, so many people like to wear comfortable clothes. A hoodie or sweater is also a good idea in case it gets cold on the plane. What about travel pillows and blankets? Sometimes it can be cumbersome to carry them with you on your trip, so just use your best judgement as to what you’d like to bring. Also keep in mind that most international flights have a pillow and blanket provided for all passengers. Noise-cancelling headphones can be useful if you’d like to sleep on the plane, or get some respite from the noise. Electrical power ranges vary greatly depending on which country you are visiting, from a voltage of 110 V (volts) to power rated up to 250 V, and with a frequency of either 50 Hz or 60 Hz (hertz). Luckily, most portable electronic equipment like mobile phones, digital cameras, laptops, and tablets (iPad & Kindle) are built to handle that range in voltage and frequency. In these cases, all you need to charge your equipment while traveling is to snap on the correct international plug on top you the one you normally use. But if you are bringing other electrical equipment, you should check your owners manual to be sure they can be charged with different a different voltage and frequency. The following page has more technology tips.